All Browning Trail Cameras feature the ability to take a time-lapse video clip of the wildlife on your property. The time-lapse function allows you to set up your camera in the field, and program it to take pictures automatically at fixed intervals. This feature is helpful when you set a camera up in a new location such as a large field, where you are not sure where the wildlife is entering the field. The camera will take images of the entire field, so you will end up capturing wildlife at 200 + yards away, where a conventional camera would not normally trigger a picture. Don’t worry, our Timelapse Plus feature also takes pictures of game via standard infrared detection, day and night so you are guaranteed to not miss a single event. To play back your time-lapse video clips, all Browning Trail Cameras include our industry leading Buck Watch Timelapse Viewer Plus software. 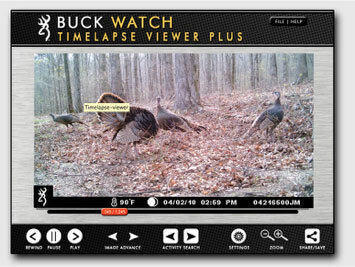 The Browning Buck Watch Timelapse Viewer Plus software is an incredible tool for managing the wildlife on your property. The exclusive Timelapse Viewer Plus software package allows you to view a full day of activity in a few minutes. Search, save and share single images or easily export a video clip to all of your friends. BTC-5HD STRIKE FORCE AND BTC-6HD DARK OPS. Some users have reported that their camera will not turn off when the power switch is in the “off” position. The camera software update will fix an issue with the camera’s power switch. This version will also help improve battery life. Cameras running software version F01150 may experience this issue. 1. With the camera power ON, press the MODE button to enter the setup menu. 2. Use the UP arrow to find the SOFTWARE UPGRADE menu item. 3. Press the “E” button. The word “NO” will begin flashing. 4. Press the “E” button again and the camera’s software version will appear. The software upgrade files are compressed. Or “zipped” files. Your computer should have the necessary software installed to “unzip” these large files when you click on them. If you need good free “unzipping” or file decompression software, you can download and use a program called “Stuffit Expander”. It is available at the following link: www.stuffit.com. They have versions for PC and Mac users. There are free and paid versions of the software available. Go with the free version, it works great.